Happy Friday everyone! I'm so excited to share another Summer Home Tour with you today from Postcards from the ridge, An absolutely delightful blog where you will find all sorts of helpful tips, DIY and beautiful decorating ideas. I love the way Angie has freshened up her home for these hot summer months. Come along with me and take a peak. You'll be glad you did! Hello friends, old and new! 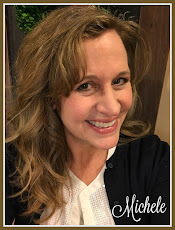 I'm Angie and I'm so thrilled to be visiting Michele's blog today. 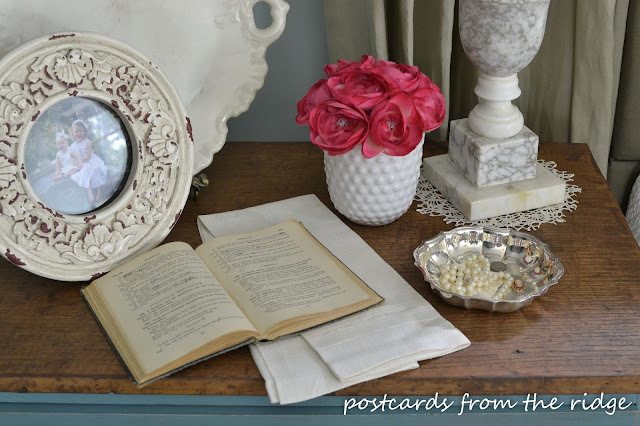 She always has the prettiest ideas and I'm happy to be able to join with some other very talented bloggers on her summer home tour series. 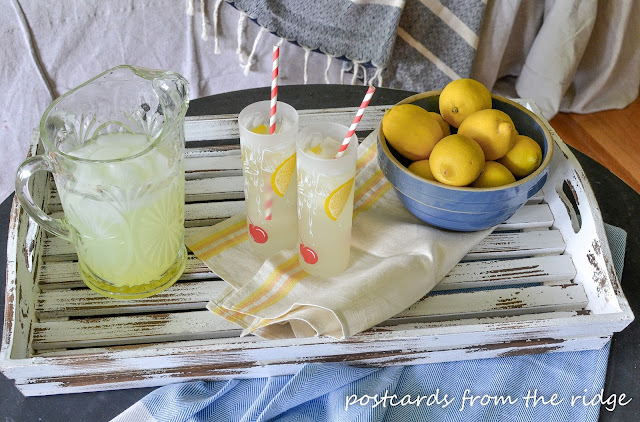 I blog over at Postcards from the Ridge mostly about home decor and DIY, but I also share a few crafts, recipes, and photography posts. 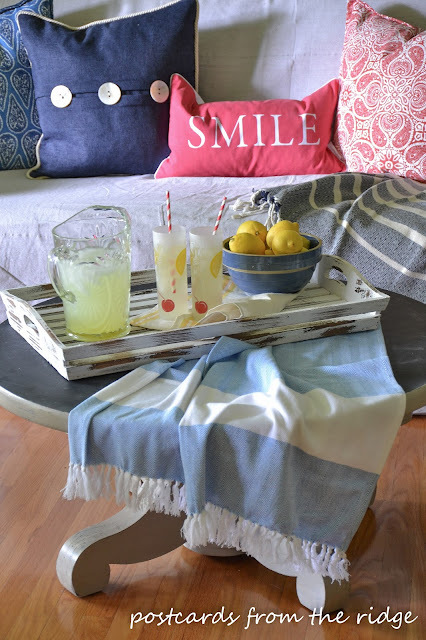 My style is eclectic with a blend of farmhouse, bohemian, and cottage. I'm not afraid of mixing things up. I'm a photography geek, and I love to visiting new places, being out in nature, and have been married to my college sweetheart for 24 years this summer. We have 2 teenage daughters that we're very proud of. In our home I'm always making little changes throughout the year. It's so simple to transform a space with just a few small tweaks. 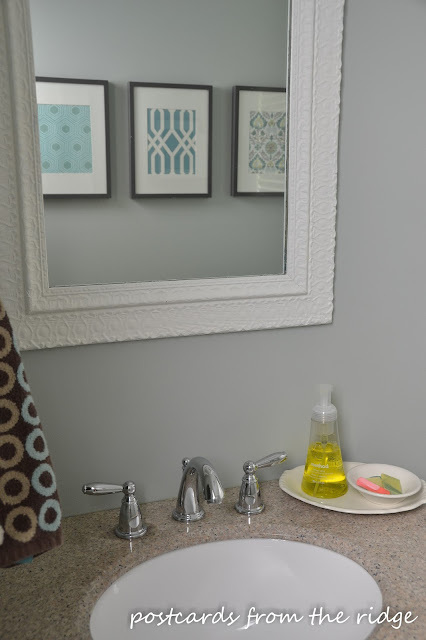 Hopefully you'll get some ideas today that you can incorporate into your own space! In the breakfast room I added some blue and with with a punch of yellow. 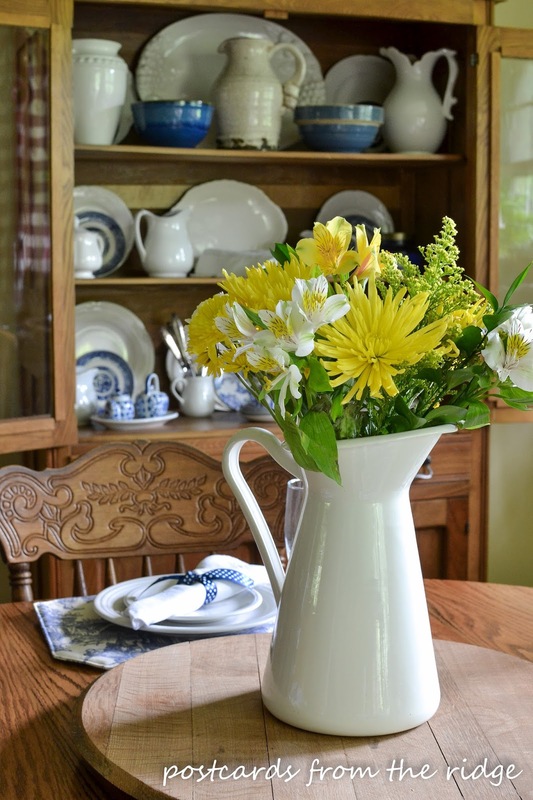 Nothing says summertime like yellow flowers, don't you think? And they go perfectly with the blue and white dishes in the hutch. The dishes in here get changed out seasonally 3 or 4 times per year. It's an easy way to change the mood of the space. 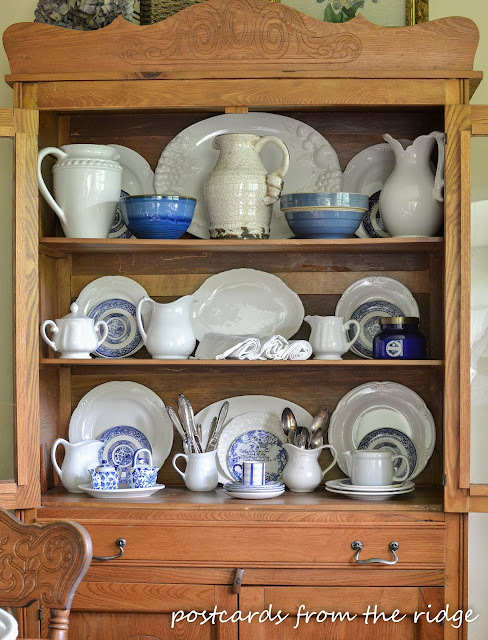 And since I'm a bit of a dish hoarder, it gives me a chance to look at my collections on a daily basis. The blue and white looks fresh and summery but it will all change in a couple of months to colors that look more like fall. Our Fiesta dishes were wedding gifts 24 years ago and we still use them every day. They're nearly indestructible! And since they're white they go with everything and I haven't gotten tired of them. 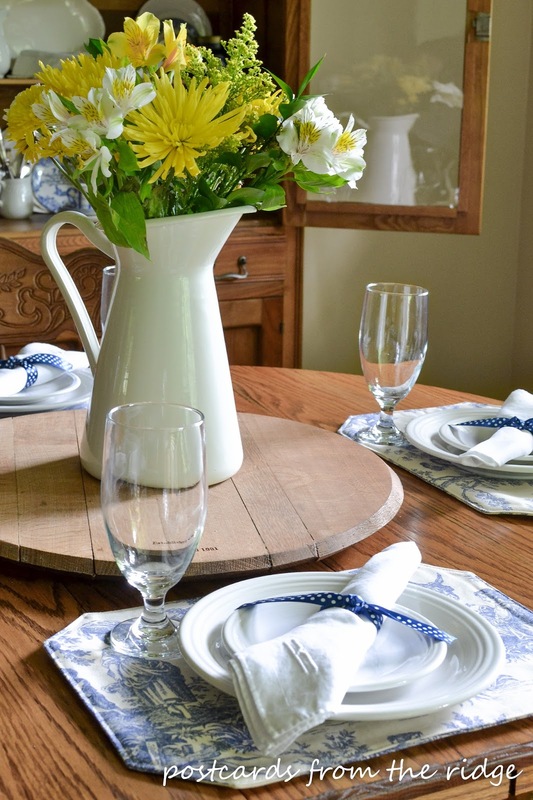 A simple change to napkins or placemats or even glassware can make them look good any time of the year. More blue accents in the neighboring living room with pops of red and yellow. I made the prints on the wall earlier this spring and love the way they turned out. They might be a little sophisticated for the drop cloth covered sofa, but I like to mix different styles. I say use what you like and don't worry so much about the rules. 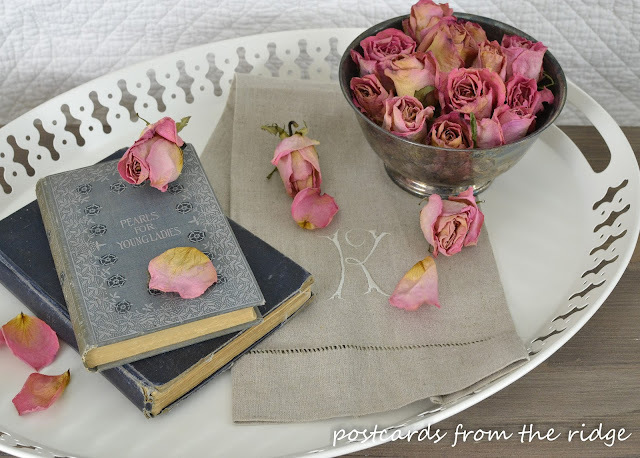 The tray was a recent find but the pitcher, glasses, towel and bowl are all vintage. Mixing old and new things together is one of my favorite things to do. The pillows on this sofa change out seasonally. 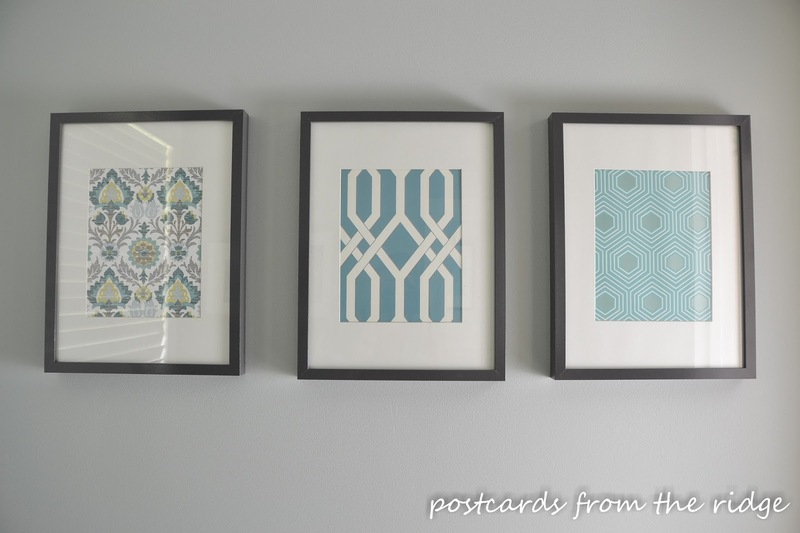 It's such an easy way to update the look of a space. 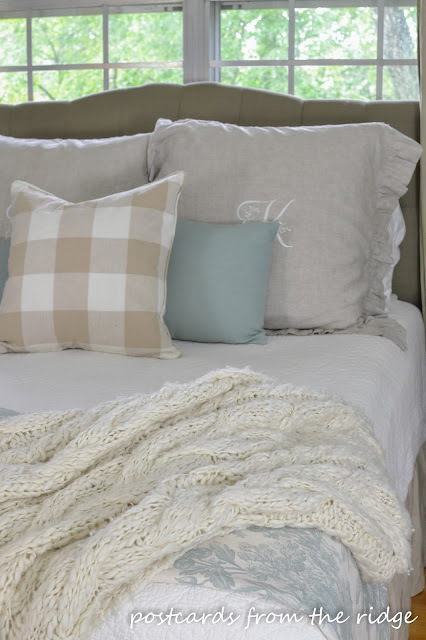 In the master bedroom I lightened the look for summer with a white quilt and some soft colored accents. The white and soft blue gives the room a nice airy feeling. I like to keep a throw on the bed even in the summer for times when I get cold at night. I got this one a couple of years ago and it's not exactly summery, but it's one of my favorite things so I keep it out year round. 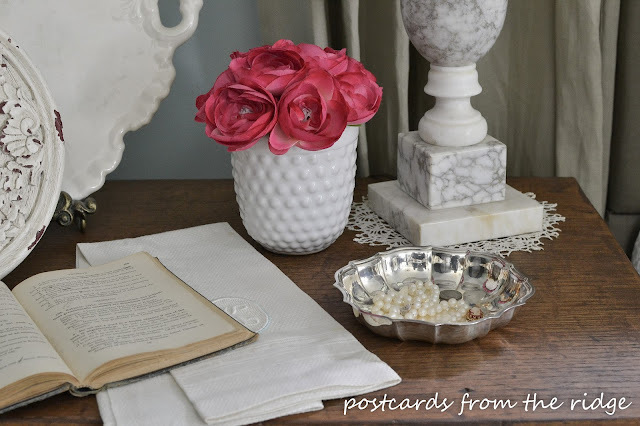 Over on my night stand I added a pop of color with some flowers. 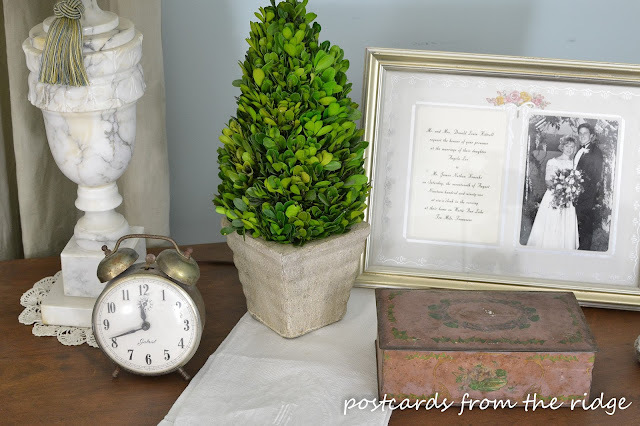 Not wanting to make my husband's night stand too feminine, I added a preserved boxwood topiary instead of flowers. It adds just enough color. On the bench at the foot of the bed I added some dried roses, vintage books, and a linen towel on a cottagey tray I found at Ikea a few weeks ago. 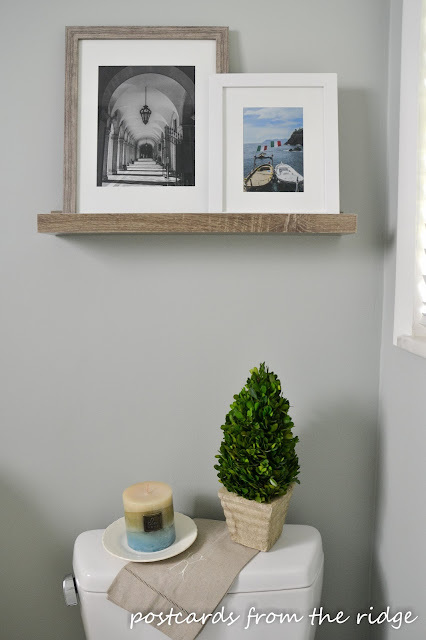 Photos of some of my favorite summer scenes were added to a picture ledge in the half bath. We just had this bath remodeled a couple of months ago and there was still one wall that needed something hanging on it. A couple of days ago I made artwork similar to what I did in the living room, but in this room I used aquas to remind me of ocean waters. It's impossible to get a decent photo in a 5 x 5 room, but here's how they turned out. This is another super easy way to change things for the season since these can be updated in just a few minutes. 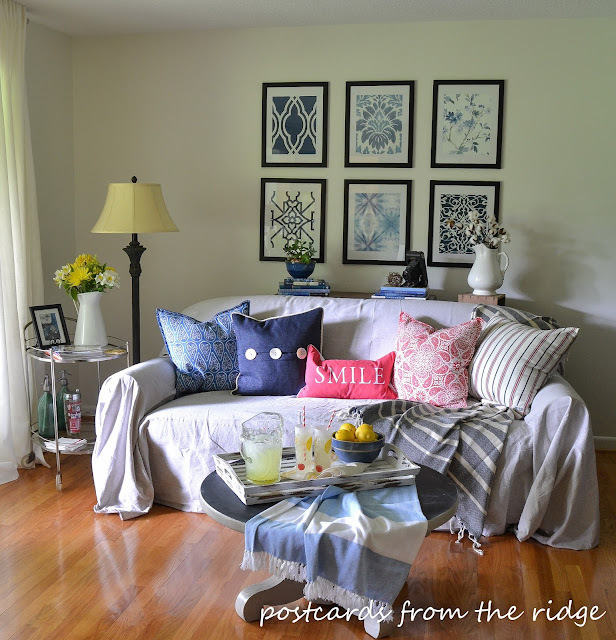 I hope you've enjoyed the glimpse into our summer styled home. It's been fun putting it all together. And thanks again for having me on the tour, Michele! What a pretty house! Thanks for doing your summer home tour series again this year. Very inspiring! 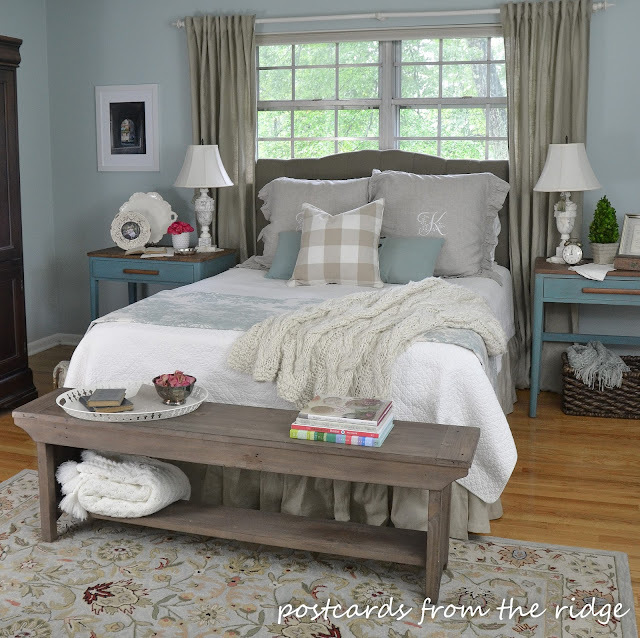 Another wonderful gorgeous home tour in your series. Angie has a sweet home. Love her master bedroom. So soft and serene. Very pretty.